This one of three very interesting and highly decorative, mid-rise, "Perpendicular Gothic" apartment buildings designed shortly after the turn of the 20th Century by Harde & Short. The others include the Alwyn Court at 180 West 58th Street and the Studio Building at 44 West 77th Street. This building, which was completed in 1908, is distinguished by its attractive red masonry, excellent fenestration and rounded corner. Describing this trio of buildings as "the best gingerbread in town," Paul Golberger noted in his book, "The City Observed, A Guide To the Architecture of New York, An Illustrated History" (Vintage Books, 1979), that this was "the best" of the trio, adding that "The detail is an eclectic mix of Elizabethan and Flemish Gothic, and it is just elaborate enough to be showy, but restrained enough not to compete with the separate, secondary level of texture created by the dozens of 12-over-12 double-hung windows, a veritable curtain of tiny square panes." 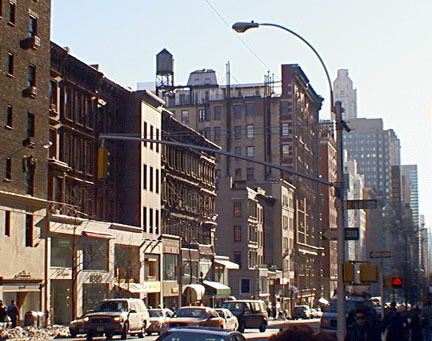 Indeed, the replacement of multi-paned windows with larger single pane windows has significantly altered the appearance and aesthetic integrity of many of the city's finest residential buildings as owners have concentrated on "energy efficiency" and modern interior design to the detriment of their building's architecture. This 33-unit building originally had its entrance at the base of its rounded corner before it was moved to the sidestreet. Given the considerable traffic on Madison Avenue and the high value of its retail space, the move was understandable and well done. The building's cornice is quite stylish, almost like a French beret and helps contain the very dynamic facades that are full of terracotta embellishments that add depth and shadows. The building's location is in the heart of the most fashionable retail strip in the world and close to the Plaza business district. It has an exposed rooftop watertank, a doorman, and sidewalk landscaping, but no garage and no health club. The site was formerly occupied by the Church of the Holy Spirit, which became the All Souls' Episcopal Church. "In 1905, Charles F. Rogers, who had built the Prince George and other hotels, bought the All Souls church site at the northeast corner of Madison Avenue and 66th Street. Rogers, the son of the sculptor John S. Rogers, lived at 60th Street and Madison Avenue and was an All Souls parishioner....The new building dominated the Madison Avenue brownstones, and its distinctive round corner tower was unusally prominent. The square-doughnut structure has a central light court, but the majestic multipaned windows -framed in white terra-cotta and rising to overhanging, screen-like assemblies of Gothic ornament - are what catch the eye....The building was divided into only two apartments...on each floor. Only a handful survived intact, still grand and elegant but with most of their unusual woodwork painted over. The building opened in 1908 as 777 Madison Avenue.....In 1929 the entrance was moved onto East 66th Street, giving the building its present address,...The exterior remained in fairly good shape except for a gradual buildup of grime from engine exhaust (Madsion Avenue streeetcars were replaced by buses in the 1930's). From 1928 to 1973, the building was owned by the Bing & Bing real estate company. Major change came after the mid-50's, with most of the overhanging decorative work at the sixth and 10th floors either cut back or stripped away entirely. In 1973, 45 East 66th Street was acquired by a builder, Sigmund Sommer, who cut back some services, discharged the elevator attendant and replaced incandescent lighting with fluorescent in the hallways. Tenants conducted a rent strike....They ultimately won most of their battles and the Bing interests took the building back in the spring of 1977, just as a tenant effort of landmark designation was starting....In 1987, a partnership managed by M. J. Raynes bought the building and began a cooperative conversion plan that was completed last month." A photograph in the collection of the Museum of the City of New York indicates that the building originally had a wrought-iron fence on both the avenue and the sidestreet and that a high rather bulky balustrade was above the cornice. Both the fence and the rooftop balustrade no longer exist and the latter is not missed as it was not terribly delicate or graceful and the building, which was designated a city landmark, looks much better without it.